Here’s where we are (red dot)…Watch the Torno Italy Video! 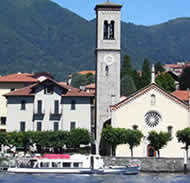 Torno hotels are far more remote and far less expensive than the hotels in Como. Located 6km north of Como, it has cast its spell on some of our greatest poets and writers for centuries. Here is a list of hotels in Torno Italy arranged by popularity. Location: Right on the lake close to the boat dock. Description: A great hotel in the historical center of Torno with its own restaurant. Very friendly service and elegant rooms. Elevator in service. No Online Booking Available. Call +39 031 419311 to check rates/availability. Location: On a hilltop overlooking the lake and 3km from the Torno town center. 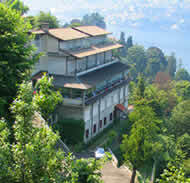 Description: Beautiful panoramic views of Lake Como available in most rooms. Rooms are basic, but clean and tidy. Hearty buffet breakfast and plenty of free parking. No Online Booking Available. Call +39 031 419300 to check rates/availability. Here is a list of 1 star Lake Como hotels in Torno Italy for budget travelers only looking for very basic rooms and amenities.